Last Saturday, all of our 80,000 alevins, young salmon that still have their yolk sac attached, were moved from their rearing trays into holding troughs. In the holding troughs, our alevin are acclimated to the process of feeding before they are released into the rearing pond. The holding troughs are also used to check on their development process as they finish the process of “buttoning up”, which is where they lose their yolk sac from their bellies. We had the Students Saving Salmon Club and other volunteers show up and help us with this large move for our small coho salmon. They are moved from the trays that simulate their natural environment with their meshed-made redds into the holding troughs by gently placing the tray into the trough, and are then allowed to swim outside of the only world they’ve known so far. After making sure all of the alevin have swam out of the trays, the trays are then rinsed off. In the holding troughs, our volunteers helped remove eggs that didn’t make it. 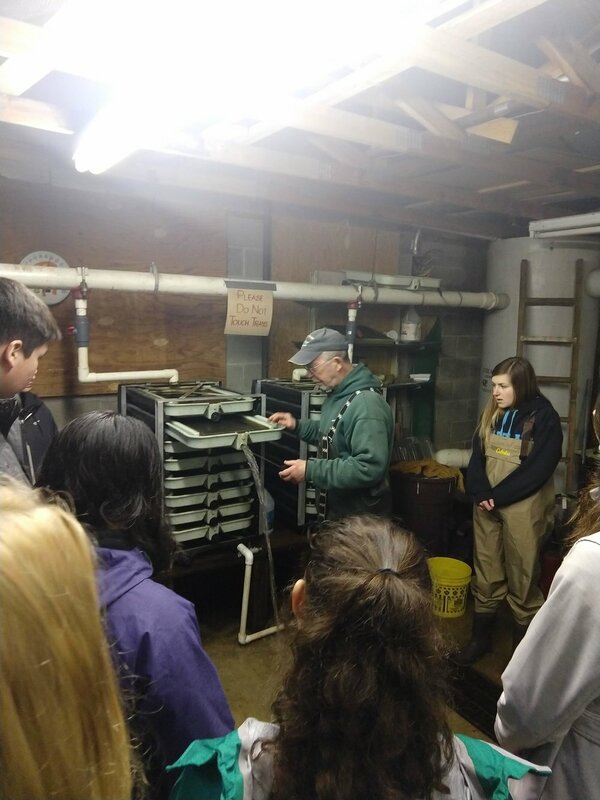 The water that flows into the troughs comes directly from Willow Creek, which provides the oxygen and clean water that young salmon vitally need. A cool thing to notice if you get to see them in their troughs is how they swim against the current. Salmon instinctively do this either because they get more oxygen since water is flowing directly past their gills or because this is how they feed by eating small zooplankton that are carried with the current. Rarely, maybe a couple a season, WCSWEC finds an albino salmon among our tiny, developing salmon, as shown in the picture below! These salmon are a favorite with school groups and something to look for when they are larger and in the rearing pond. Albinism is usually inherited, but may be due to genetic mutation, diet, age, disease, or injury. Since Albinism, when inherited, is a recessive trait, both parents carrying the trait could look normal and spawn a salmon with Albinism. Chromatophores are the specialized cells that contain and produce pigments, and are responsible for producing skin and eye color in many types of animals. Cyanophore is a bluish pigment that is unique to fish and amphibians. Another odd example of weird salmon pigmentation is when their meat is white, as compared to the usual red meat. Salmon get their usual red color from eating small crustaceans which contain carotenoid, a red-orange pigment. When salmon lack the ability to metabolize this pigment, they can have meat that is white.